How are salmon impacted by a two degree change in the water? We look at how our region’s salmon will be impacted by climate change. 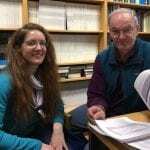 KBCS’s Yuko Kodama interviewed Dr. Rachel White, University of Washington Bothell instructor and researcher and Dr. Jim Winton, Northwest Fisheries Science Center at the US Geological Survey, Chief of Fish Health. They’ll be panelists, along with Dr. Nick Bond, Washington State Climatologist and University of Washington Researcher at Salmon In A Time Of Climate Change this coming Wednesday.